-- Assemble clips in the Magnetic Timeline without clip collisions or sync problems. -- Use Clip Connections to attach B-roll, sound effects, and music to the timeline. -- Reduce clutter by grouping clips into a Compound Clip. Easily expand it back to single clips. -- Perfect your pacing right in the timeline with the Inline Precision Editor. -- Cycle through different shots, graphics, or effects at one place in the timeline with Auditions. -- Import a broad range of formats including native AVCHD, H.264 from DSLRs, and more. -- Content Auto-Analysis captures camera metadata and analyzes shots in the background. -- Choose analysis options for stabilization, rolling shutter correction, and audio enhancement. -- Create and apply custom keywords on the fly as you select ranges in clips. -- Smart Collections let you dynamically organize content and find any shot in a few clicks. -- New 64-bit architecture uses all the RAM in your system for larger projects and richer effects. -- The Cocoa foundation makes Final Cut Pro more responsive, interactive, and fun to use. -- Final Cut Pro taps the GPU on the graphics card and all the cores in your Mac for speed. -- Background processing lets you keep working without interruption. -- A ColorSync-managed color pipeline produces accurate, consistent color across applications. -- Preview effects to see how they look with your footage before applying them. -- Change the look of titles, transitions, and effects using intuitive controls. -- Control effects with precision using a keyframe editor that appears directly in the timeline. -- Adjust the Ken Burns effect with simple onscreen arrows for start and end points. -- Let Final Cut Pro repair significant audio problems such as hum, excessive noise, and more. -- Sync DSLR video with separate audio in a single step, with instant audio waveform matching. -- Enrich your soundtrack with a library of royalty-free sound effects and audio effect plug-ins. -- Create immersive audio experiences in 5.1 surround. -- Improve the look of any clip with the single-click Balance Color feature. -- Apply the Match Color feature to match the looks of two clips shot under different conditions. -- Manipulate color, saturation, and exposure with the Color Board. -- Fine tune color for a specific color range or area of the screen using keying and masks. -- Export projects to Apple devices and websites such as Vimeo, YouTube, and Facebook. -- Add your content to a set of themed menus, then burn a DVD or Blu-ray disc. -- Output files for HTTP live streaming in a single step. 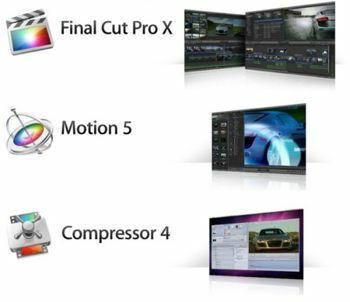 -- New 64-bit architecture supports deeper, multilayered effects for use in Final Cut Pro. -- ColorSync-managed color pipeline produces accurate, consistent color across applications. -- Shared Render Engine provides consistent quality with Final Cut Pro and Compressor. -- Rendering uses floating-point, linear-light color space for exceptionally realistic results. -- Motion taps the GPU on the graphics card for high-speed rendering and exporting. -- Work fast using a single-window interface with a familiar look and feel. -- Customize Final Cut Pro titles, effects, and transitions by opening them in Motion. -- Create Smart Motion Templates with simple controls for making changes as you edit. -- Build stunning 2D and 3D compositions with more than 1900 Apple-designed elements. -- Make adjustments to any parameter during playback and instantly see results. -- Design dramatic text effects with complete control over position, opacity, rotation, and more. -- Animate text instantly by choosing from more than 200 text behaviors such as Type On. -- Build a credit roll by importing a text file; the Scroll behavior optimizes the speed for you. -- Move, scale, or rotate a single character with the Adjust Glyph tool. -- Ripple text one character, word, or line at a time with the Sequence Text behavior. -- Choose from more than 230 behaviors for natural-looking motion without programming. -- Enhance your 2D or 3D animations with more than 130 filters using the FxPlug 2 standard. -- Track a moving object in a video clip with the point tracking and match move feature. -- Create an accurate chroma key in a single step with the new Keying filter. -- Apply the Linking behavior to make parameters for one object animate related objects. -- Use SmoothCam to eliminate camera jitters, and image stabilization to smooth bumpy shots. -- Transition from 2D to 3D space by adding a camera or cameras to any 2D project. -- Set up realistic shadows that animate dynamically with the movement of cameras and lights. -- Turn any shape, video plane, or paint stroke into a reflective surface. -- Highlight or de-emphasize various objects by defining a range of focus. -- Track objects or groups of objects with the Camera Framing behavior. -- Export projects to Apple devices and popular websites such as Vimeo and YouTube. -- Choose to output the ProRes 4444 format for uncompressed quality at small file sizes. -- Use Compressor to customize encoding settings available in Final Cut Pro. -- Choose from a wide array of codecs, sizes, frame rates, and other parameters. -- Save your custom settings in Compressor; they automatically appear in Final Cut Pro. -- Share settings with other editors, even if Compressor isn't installed on their workstations. -- Experiment freely with encoding options, using real-time feedback in the Preview window. -- Find exactly the setting you need in just a few clicks in the updated settings library. -- Set up batch processes to streamline the encoding of large numbers of files. -- Build batch templates to combine encoding with tasks such as moving or copying files. -- Create self-contained Droplets to encode on the desktop with drag-and-drop ease. -- Use one-step settings for Apple devices and websites such as Vimeo, YouTube, and Facebook. -- Work with a choice of themed menus to encode and burn a DVD or Blu-ray disc. -- Add chapter markers for discs or podcasts distributed on iPad, iPhone, iPod, or Apple TV. -- Encode to a broad range of industry-standard formats, such as MPEG-2, H.264, and ProRes. -- Generate files for HTTP live streaming in a single step. -- Import Targa, DPX, TIFF, PSD, or PNG image sequences and encode them to any setting. -- Tap into advanced encoding features for adding closed captioning, metadata, and more. -- Convert any file from its source format to another format, such as NTSC to PAL or SD to HD. -- Clean up and customize your content using image filters, a timecode overlay, and watermarks. -- Speed up video, slow it down, or adjust the frame rate to make the duration match a runtime. -- Save time by distributing encoding work among multiple cores and workstations. -- Install Compressor on any Mac to activate it as a cluster node for distributed encoding. -- Speed up encoding in Final Cut Pro by choosing a Compressor cluster for output processing. -- Activate QuickCluster for dynamic configuration of nodes based on available resources. System Requirements: 2GB of RAM (4GB recommended), OpenCL-capable graphics card or Intel HD Graphics 3000 or later, 256MB of VRAM, display with 1280-by-768 resolution or higher, 685MB of disk space. Final Cut Pro X Suite Tnt Village Mac OSX rapidshare mediafire megaupload hotfile download, Final Cut Pro X Suite Tnt Village Mac OSX torrent emule download, Final Cut Pro X Suite Tnt Village Mac OSX full free download, Final Cut Pro X Suite Tnt Village Mac OSX rar zip password or anything related.